After 100 years of promoting horticultural excellence, the RHS Chelsea Flower Show entered its second century with the 101st show in the heart of London's West End. People travel across the world to come and see the finest in floristry, plants and show gardens in the world, and this year was certainly no exception. It doesn’t matter how many times you visit the RHS Chelsea flower show, you can always take away tips and ideas for your own garden, however small it may be. With this year being the centenary year of World War One, some gardens and exhibits incorporated this theme at the centre of their display. This year also celebrated the 50th anniversary of RHS Britain in Bloom and to mark this occasion Alan Titchmarsh designed a garden From the Moors to the Sea with Kate Gould. The garden celebrated the work of all those who have been involved in Britain in Bloom over the last half century. The garden acted as a reminder of the importance of plants and gardens and the positive effects of improving our surroundings through gardening, wherever we live. The display also referred to Alan’s horticultural career of 50 years, beginning on the edge of Ilkley Moor. With 15 large Show gardens, 10 Fresh gardens and 7 Artisan gardens there was certainly plenty to see and there also seemed to be a big focus on the young first time designers under the age of 30. I must admit the Artisan gardens were my favourites. I think it’s because you can relate to them more easily, as being smaller gardens you can get up close to the whole garden, seeing the planting scheme and the finer details; they were a delight to behold. The planting seemed similar across a lot of Show gardens this year, with cooler colours – blues, whites, yellows and amazing shades of green, all of which seemed to give off a relaxed feel. Irises, Lupins, Peonies, Cow Parsley, Euphorbia, Eremurus, Foxgloves, Box Topiary, Astrantia and sculptures all played a big part in the gardens this year. Apparently blue and black are the hot colours for 2014, and The Black Tomato definitely stood out! My favourite Show garden was The Telegraph Garden with the magnificent lawn, Euphorbia, Box, Fennel and the lovely blues and lime-green colours. It was beautifully proportioned and looked very crisp, fresh and elegant. A lovely piece of work, which scooped a Gold award. I also feel that the No Man’s Land garden deserves a specific mention. This was a concept garden based around the idea that the landscape of the Western front of World War I was very badly scarred. It had 3 zones: A mine crater which is represented by a water basin, the Lost gardens area indicated what would have happened to someone or some of the villages and towns which were devastated during the war and a grass mound which represented the earth forming craters, tunnels and trenches left after the War, but which later managed to heal and regenerate. This garden won Gold and so rightly deserved. Another large show garden which educated people on how to take responsibility for managing storm water in their own gardens was the RBC Waterscape Garden by Hugo Bugg. It was a fresh and fun garden which won gold for the first time Chelsea designer. The Fresh Gardens are at the cutting edge of garden design and aim to get people to think "outside of the box" in design terms. Boundaries were certainly pushed this year and my favourite fresh garden was Reachout. The concept behind this garden evolved following a discussion with young people living in a Lancashire Town. The garden represents the journey that a young person goes through to reach adulthood and the many obstacles that block their way. 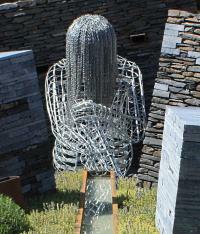 A striking metal sculpture formed the garden’s centrepiece, depicting a figure crouched against a slate wall, dipping its hand into a long water channel. The channel led the way through a series of stone columns that grew smaller and smoother before eventually blending into a soothing landscape. The garden was planted with plants known for their healing properties, such as rosemary and thyme. This garden, designed by John Everiss, won a Gold medal. There were two Artisan gardens that I really loved this year for their artistic and naturalistic approach. The DialAFlight Potter’s Garden told a tale of two potters who worked their kiln before the First World War, then went off to the conflict and returned against all odds to carry on potting. Small and beautiful; very moving. The Topiarist Garden at West Green House captured the essence of 'Englishness' with a white and green palate of Lupins and Foxgloves. Not forgetting of course the topiary cut to perfection. A lovely garden which won a Silver Gilt. The Great Pavilion exhibited horticultural excellence in an area that could accommodate 500 London buses; it was huge! The Lupins and Auricula, with their magnificent display of colour, were my favourites. Seeing Clematis grown in pots was great too and would have given many people ideas if they have a small garden or space. I’d never of thought to grow a Clematis in a pot! Also new this year was a Rose called ‘Frilly Cuff’. Birmingham City Council’s exhibit marked 100 years since the start of the First World War. It showcased Birmingham’s contribution to the war with the hospital train, which brought injured troops back to the city. Trenches, planes, periscopes to see the enemy, they had it all. 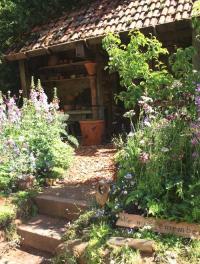 The Enchanting World of the Peter Rabbit Herb Garden by Hooksgreen herbs was very cute. The exhibit replicated, in exquisite detail, Beatrix Potter’s illustrations from the Tale of Peter Rabbit and included a wide variety of culinary and medicinal herbs, along with many heritage vegetables, wildflowers and cottage garden favourites. When the RHS judges judge the 'Plant of the Year' they are looking for excellence, something which has the wow factor and will appeal to the general public. This year it was won by Hydrangea macrophylla 'Miss Saori' with its gorgeous double-petalled flowers. 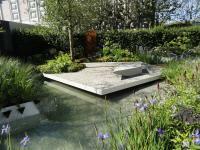 Six of the large Show gardens won a gold medal this year and throughout the show 53 gold medals were awarded in total. Chelsea is all about theatre, the best plant specimens and of course the prizes. To achieve this the exhibitors often go to exceptional lengths, for example Matthew Childs sourced his trees from Germany and boulders from Wales for his large show garden. Nothing is second best, everything has to be 100% perfect. The standards were really high this year and things were made all the more interesting with the new judging processes. It’s hard to believe that they had 70 judges making up the judging panel. With a shortage of women garden designers at the show, let’s see if more come on board next year! Another simply breath-taking show, thank you RHS and all that worked so hard to make it happen. We look forward to see what the show holds in store for next year. Published on 26 May 2014 and Filed under Reviews.